The company was actually founded a year ago (by Lewine, Berry, and President/CTO Shaun Zacharia, who all previously worked at online ad company AppNexus), and it has already run campaigns with some major advertisers. However, the company has only received a little bit of attention from the press — now it’s ready to do more of a publicity push, and it’s announcing that it raised a $2.1 million seed round at the end of last year. The round was led by True Ventures and iNovia Capital, with participation from NextView Ventures, Laconia Ventures, MESA+, the Social Internet Fund, Pinterest investor William Lohse’s Social Starts, former DoubleClick executive Paul Olliver, and Liberty City Ventures. Lewine and Berry told me that TripleLift monitors brand content across major publications and social media sites like Pinterest, Facebook, Tumblr and Instagram — it collects more than 10 million engagement points per day, they said. Then it can automatically add that content to standard banner ads. So for example, if a celebrity is seen showing off a company’s new handbag and everyone is getting excited about it online, TripleLift will automatically detect that activity and make sure an image of the handbag gets featured in the company’s ads. And it uses technology like face detection and color analysis to crop the pictures, so images of different size and proportion will look good together in an ad without any extra work from the advertiser. 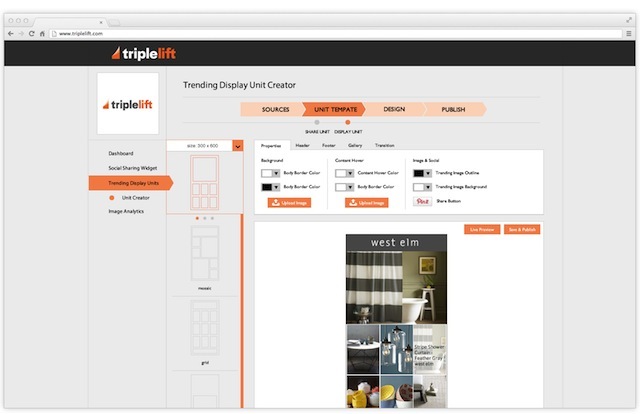 TripleLift says it has already run campaigns for Martha Stewart, Gucci, H&M and Puma, among others. Right now, the data side of the business is being used primarily to power TripleLift ads (“We don’t really sell analytics, and we don’t send them into our dashboard a lot,” Lewine said). But over time that could change as the company expands its analytics features, helping its customers understand what content is working and what isn’t. Oh, and if you’re wondering about the name, Berry said the company is trying to “tie together owned, earned, and paid media” — in other words, brand content, editorial content and advertising. Plus, there are three founders, and three main products. “We can come up 10 other reasons,” Lewine added.